We recently assisted The Phoenix Partnership with a project at Moulsham High School in Chelmsford. 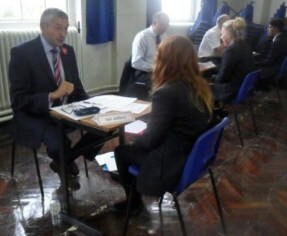 The purpose of the project was to provide Year 11 students with a mock interview for a job or further education course with someone from a business background. This is a very useful exercise to help prepare the students for real interviews when they leave school next summer. Ian Jeffery represented Ruggles & Jeffery and personally conducted 11 interviews at half hourly intervals. The feedback received from the students was very positive and the school confirmed in writing that the project had been a tremendous success and a very worthwhile learning experience for the students.